This customized branding (printed in one colour) can be printed on each side of the cube and on each paper sheet, providing maximum exposure universities, small business, multi national businesses and conferences in gneral. They make popular giveaways; they are great to hand out at trade expos or recruitment fairs. 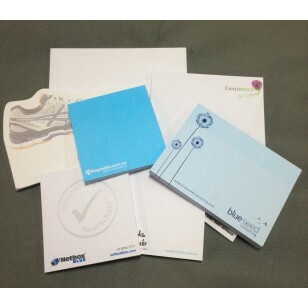 The cubic note pad contains a stack of paper and each sheet has an adhesive backing that allows the paper to be easily affixed, removed, and reapplied to most surface areas including a computer monitor, wall, light switch, or refrigerator. It also keeps the surface free of residue when removed, unlike tape that often leaves a gunky mess. The price includes the cost of the one-colour print image or wording, but does not include GST. Printing is done in Australia and product(s) can only be delivered to customers within Australia. Branding goes onto each page on the sticky note cube.